Public transport is quite rare in the United States, and where it does exist it tends to be confined to local city services. Consequentially it was quite a surprise to learn that the two largest amusement parks in the greater San Francisco area can both be reached without a car. 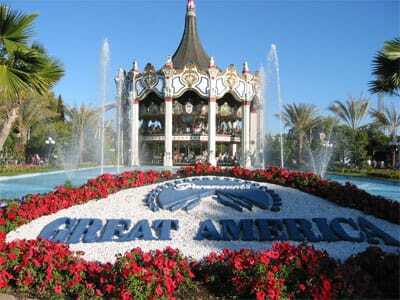 Great America is reached by taking the BART train to the Fremont stop, and changing there to a local bus service. Be warned, however, that there is considerable demand for this bus, and queueing etiquette is conspicuous by its absence. Failure to stand your ground will result in you having to make alternative arrangements. The first port of call was what we fully expected to be the slowest loading ride in the park. Invertigo (#281) is one of just three operational Vekoma Invertigo coasters in this world, and my second. This model wasn't running quite as smoothly as the Kings Island model but the bumps were not severe. As an aside, heading here first was the right decision; the ten minute wait we faced had ballooned to at least an hour by the time we disembarked. Demon (#282) was one of the first custom looping coasters to be built by Arrow Dynamics, and given that it was a surprise to discover that it ran considerably more smoothly than some of the more recent models, such as the horrible pile of scrap metal at tragic mountain. Though the ride is twenty eight years old this year it's certainly not obvious to the average rider. Conversely, the younger Grizzly (#283) feels every one of its eighteen years, a testament to the ineptitude of the carpenters tasked with maintaining it. Some sections of the ride ran reasonably well, but the less said about the rest of it the better. Two of the park coasters are off limits to adults; the Runaway Reptar and Taxi Jam. The latter was hardly a loss, but the former looked to be quite a decent size, and it was a disappointment not to be allowed on board. A quick stop on the Psycho Mouse (#284) brought us to what is arguably the most interesting coaster in the park. Top Gun (#285) was the second inverted coaster to be built by B&M, and the first that can be regarded as a custom model since the first went on to be cloned in multiple places. The manufacturers took advantage of the available terrain with their design, with a memorable low pass over water that comes near the end of the course. The layout overall was fast and furious, making the ride easily the best coaster in the park. The final coaster available to us today was also the second installation of a then new B&M coaster design, though in this case the product turned out to be far less successful in the long run. Vortex (#286) is a stand-up coaster, one of only a handful to be built, and much it pains me to say this, the ride is awful. The train goes far too fast for the manoeuvres it takes, and the forces generated are extremely uncomfortable for anybody with male anatomy. One ride was definitely enough; if ever a ride deserves trim brakes this is it. The only other ride I bothered with today was the Intamin-built Drop Zone. There's not a lot unique that can be said about different drop towers; after all they can be summarised rather succinctly as car goes up, car goes down. Be that as it may, I did enjoy this model, and it made an excellent end to the day.